Celery and celeriac are not the same thing, despite what our attempt at a clever title might suggest. Actually distinct varieties in the same plant genus, Apium, developed from the same wild species. Celeriac is more widely appreciated in Europe than in the U.S., as a lovely replacement for potatoes, whether steamed, roasted, or mashed. Here we are using both celery and celeriac in a preparation of brook trout. See this post for a much longer appreciation of the trout itself. For this recipe, we’re playing with the flavor affinities and contrasts of celery. We begin with a very bright, unconventional slaw including celery, rhubarb and fennel and then also offer a subtle highlight with grill-dried celery leaves as a garnish. The celeriac is peeled and boiled, then pureed with butter and heavy cream to provide a delicate hint of traditional roasted celery flavor beneath the grilled trout. Our trout here was plank-roasted over apple wood. Though a pan roasted approach would as well, the smoky, grilled preparation really allows the brightness of the slaw and the creaminess of the puree to play full, complementary roles. We chose to peel a single bulb of celeriac, and then dice it into 1 inch cubes. We boiled it in just enough water to cover in a large pot, with a pinch of salt and an additional bay leaf. Once soft enough to easily crush a cube, we drained and then added 1/2 cup of heavy cream and 4 tablespoons of butter, then mashed the celeriac until fine. Options here would include pureeing the mixture until smooth. Yukon Gold potatoes could be added when boiling to create a less pronounced celeriac flavor, though celeriac is already fairly mild, with just a overtone of celery. 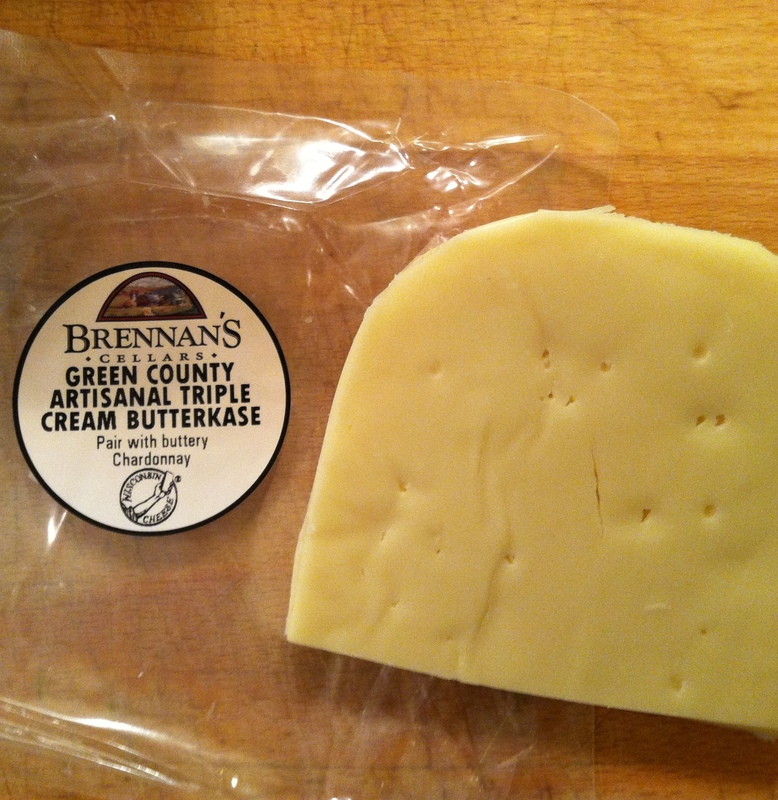 A 1/2 cup of grated white cheddar or a fresh goat cheese would also be great. The celery, rhubarb, fennel slaw is a variation on this apple, fennel salad, with thinly sliced rhubarb standing in for the granny smith apple. Either approach is excellent, but we had rhubarb on hand and enjoyed the “three stalk slaw”, a reference to the look of each of the ingredients. We made this a few hours in advance to allow the fennel to soften slightly. The rainbow trout is simply gutted and cleaned, then sprinkled with sea salt and fresh ground pepper. We had applewood planks cut from an ancient apple tree in the backyard which were ideal for this grilling application. A few leafy stalks of celery were set off heat on the grill and allowed to dry the leaves to use as a garnish. The rich, creamy flavors of the celeriac were a beautiful canvas for the smoky fish, with out three-stalk slaw providing a bright contrast, the different hits of celery flavor playing very different roles. Overall a very satisfying dish. Seasonality is a foundational idea in Great Lakes cuisine. The seasonal cycles in the region are pronounced and the agricultural traditions respond accordingly. The traditions of preservation, so important to Great lakes cuisine, is clearly derived from the seasonality. 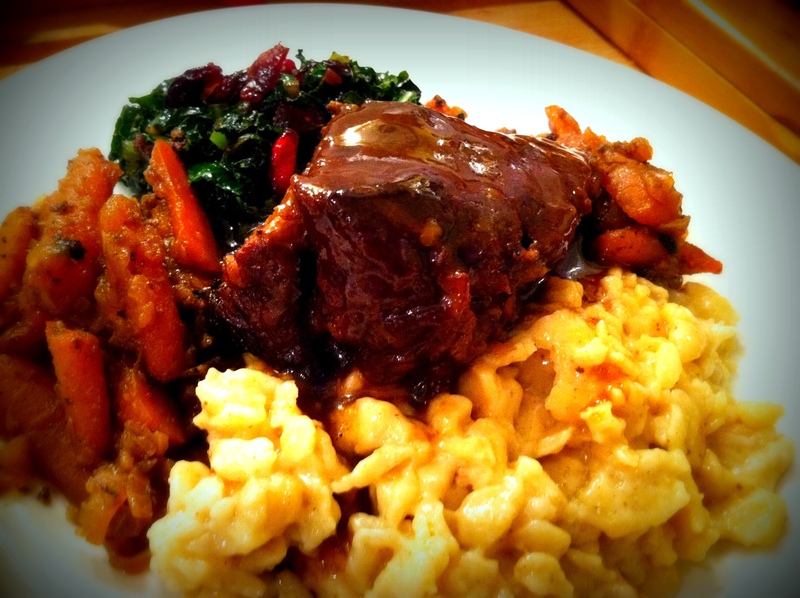 Some of the traditional meals also fall in line with the turn of the seasons. As summer fades into the golds of autumn, apples are one of the many fruits which reach full harvest. 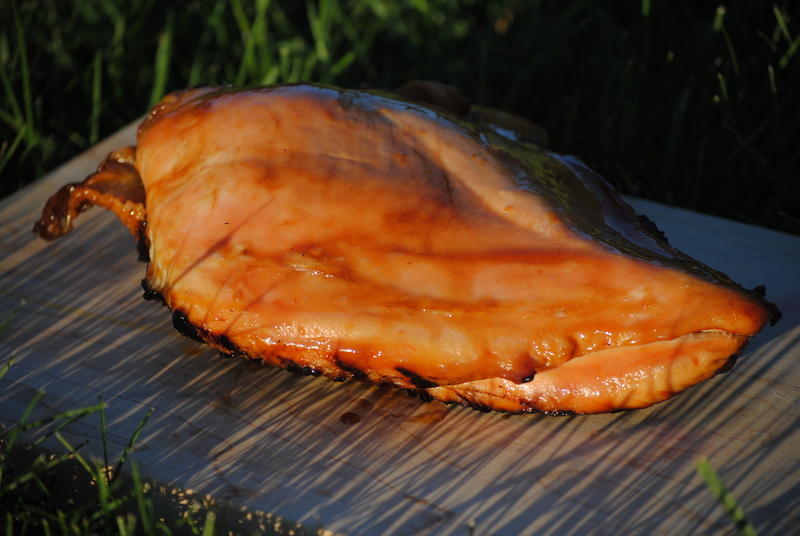 Here we use our bounty of apples in a variety of ways to add a bit of flavor to our smoked turkey. Bring to a boil, then simmer 5 minutes. Place turkey in large non-reactive container, just large enough to hold it. 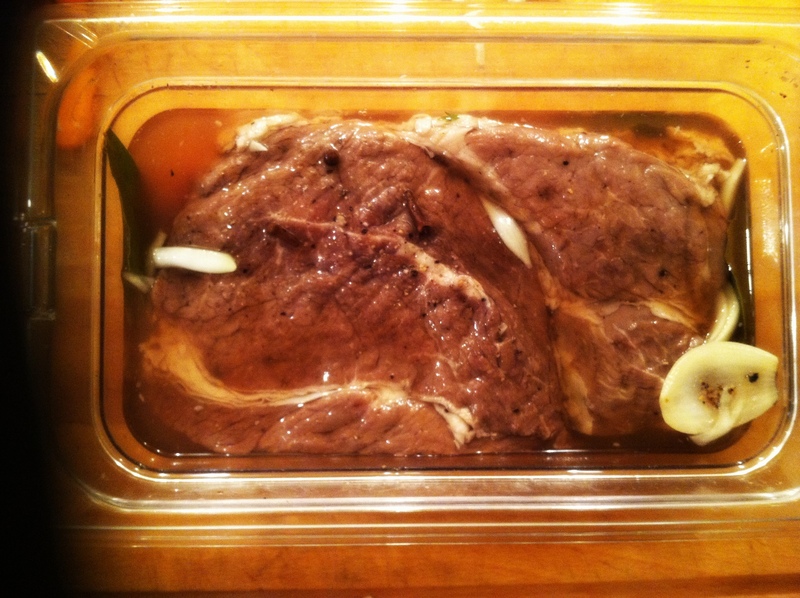 Cover with brine and allow to marinate at least 4 hours, but no more than 8 hours. Prepare smoker with applewood chips to 250 degrees. Place turkey on the smoker for 3 hours or until internal temperature of 160 degrees. Over medium-low heat in a sauce-pan, reduce by half, then remove seasonings. Add 1/2 cup brown sugar, reduce over low heat until a thick syrup. Brush Turkey with glaze every ten minutes for the final 30 minutes of cooking. Remove turkey from smoker and allow to rest for ten to twenty minutes before carving. 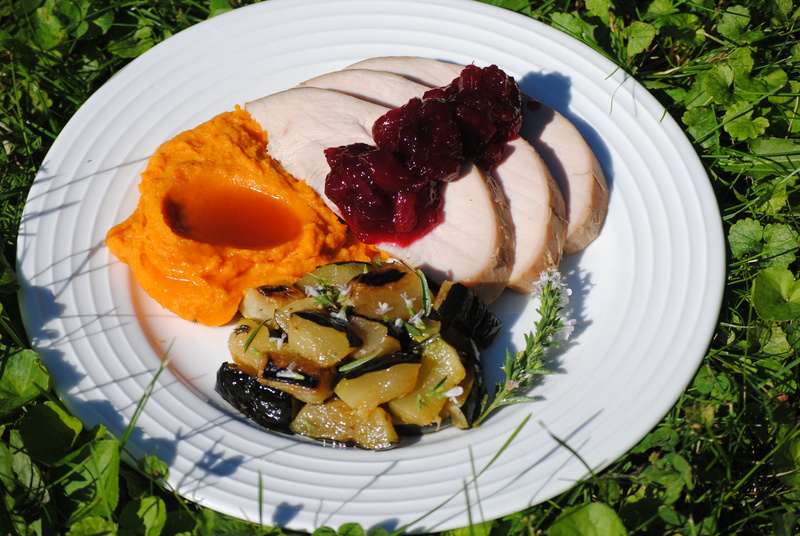 We served this with our mulled cranberry sauce (recipe below), pureed roasted sweet potatoes, and grilled zucchini dressed with winter savory leaves and flowers. Winter savory flowers have a mild, peppery finish which adds a nice flavor, in addition to the visual appeal. It is worth noting, the apple variety we used in the cranberry sauce was a Zestar, a cultivar more recently developed by the folks at my alma mater, the University of Minnesota, the same genius minds that brought us the Honeycrisp. You can use any variety well suited to applesauce. Combine all ingredients in a medium sauce pan over medium heat. Bring to a boil then reduce to a simmer. Allow the sauce to thicken, about 20 minutes. The majority of the cranberries will begin to burst and the natural pectin will thicken the sauce as it cools. Allow sauce to cool overnight or at least 8 hours. Taste for flavor. Add maple syrup to reach desired sweetness. The marinade is strained and saved. The roast is patted dry and then seared over high heat to brown all sides. The roast is removed from the pan and thinly sliced onions and carrots are added, sauteed until golden, then the roast is returned to the pan. Then the marinade is added to the pan along with beef broth and allowed to simmer for 2 hours until tender. At this point, I deviated a bit from the traditional recipe. I removed the roast and kept it warm in the oven. I strained the cooking liquid and added the carrots to the roast. I used the onion to cook thin ribbons of lacinato (Tuscan) kale, dried cranberries, and wine. 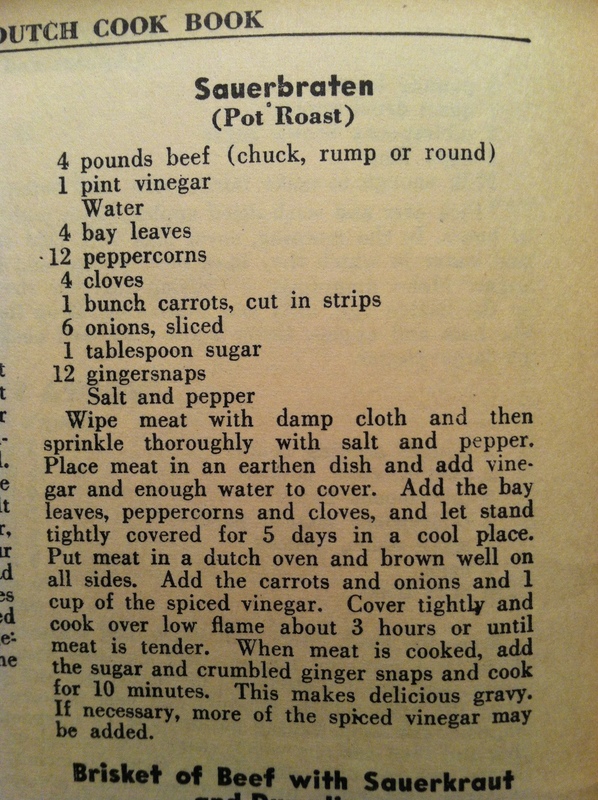 The traditional recipe calls for adding “crumbled gingersnaps” to make a gravy. Instead, I added ginger, clove, and molasses to mimic the flavors and thickened the liquid with flour for a simple gravy. The side dish was a serving of buttermilk spaetzle with a generous amount of Edelweiss Creamery’s Triple Cream Butterkase. The Butterkase from Edelweiss is rich and creamy with just the slightest hint of something a bit grassier, fuller in the flavor. Very mild, but added to the buttermilk dumplings it added just the right richness in texture and flavor to contrast the slight tang of the gravy. The kale offered a contrasting texture and bitterness. The tang of the sauerbraten was not overly pronounced in the roast, but the gravy carried those flavors through the dish. The meat was more tender than a traditional pot roast and lead to thoughts of shredding the leftovers and stuffing a periogi or dumpling. Good eating and more inspiration.